Behind-the-scenes video series to show “nitty gritty” of Respawn’s development process. 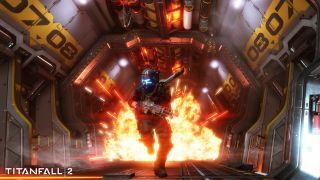 During his hands-on at E3 last month, Samuel enjoyed getting to grips with Titanfall 2’s new toys—not least the new grappling hook—so much so that he queued four times for its opening showing. In the run up to its October 28 release, developer Respawn Entertainment has now launched a video series which will explore the behind-the-scenes elements of the game, and asks players to suggest what the run of shorts should cover. For now, McCoy explains that he and his team learned a lot from the original Titanfall and as such the series will cover things like how server hosting in the sequel has changed, how its matchmaking systems have been tweaked—so as to “find better games quicker”—and how a new feature named 'Networks' will make the process of grouping together with friends easier. Titanfall 2 isn't due to launch until October 28, however Sam’s interview with lead engineer Jon Shiring makes for good interim reading.